The profits to be made in power-supply unit (PSU) retailing has attracted manufacturers like moths to a flame. 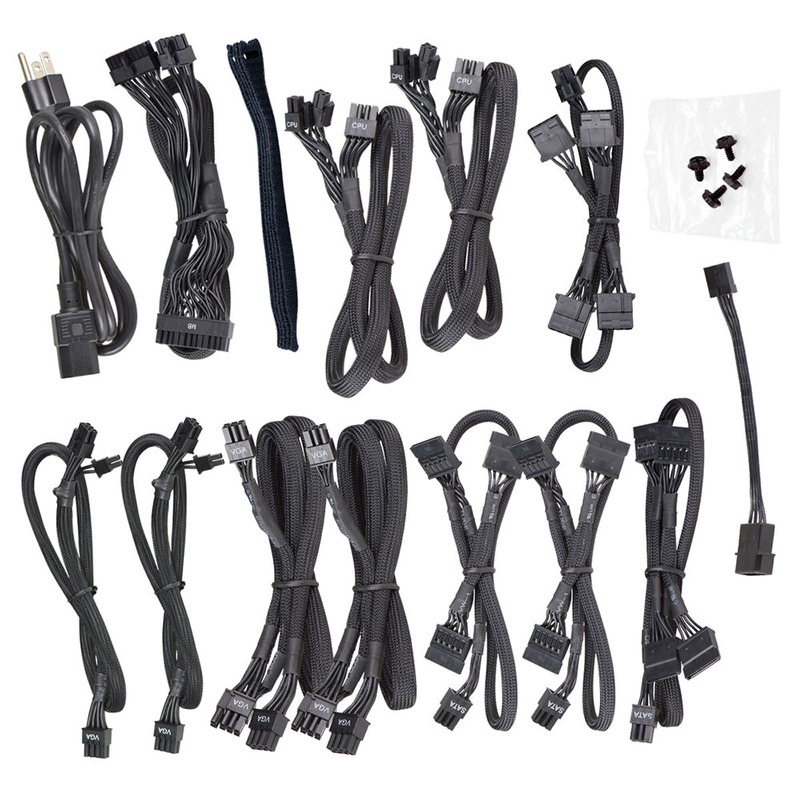 Almost everyone making PC components has sought to branch out into PSUs, so much so that the market is awash with hundreds of supplies all vying for your attention and, more importantly, wallet. There are a few key concerns that need to be addressed when aiming for the premium end of the market. The component company needs to have an excellent relationship with the original design manufacturer (ODM) - very few so-called manufacturers build the supplies themselves; they're most likely made to contract - the platform needs to span a wide range of wattages, and features such as semi-passive fans, fully-modular cabling, sky-high efficiencies and long warranties are required. Hoping to hit all those notes is EVGA. We've previously been impressed by the SuperNOVA 750 G2, which arrived at retail armed with a keen price and excellent performance. Yesterday's 80 PLUS Gold-rated supplies are today's 80 PLUS Platinum, and EVGA duly obliges with the P2 range. Offering excellent efficiency from 650W to a monstrous 1,600W, the P2 is designed for the enthusiast, so let's take a closer look at the 850W model. Little has changed superficially across EVGA's PSU stack. Other companies have ' optimised' grilles that aim to reduce noise; EVGA continues using a large stamped grille that encloses a 140mm fan which remains switched off at low loads. Globe Fan is the manufacturer of the 25mm-thick dual-ball-bearing spinner. The casing is textured and feels nice to the touch. Measurements are standard for the 650-850W units, with 150mm width, 165mm depth and 86mm height. It seems as if most manufacturers have jumped on the semi-passive fan bandwagon on premium supplies. This makes sense, we suppose, as the latest high-efficiency PSUs produce very little in the way of heat. 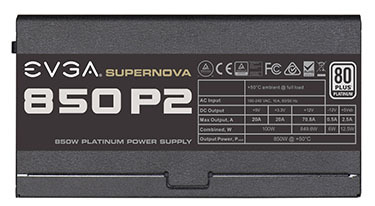 EVGA follows suit with the 850 P2, and the fan activates at 20 per cent load (170W), spins very slowly until 40 per cent load (340W) is reached, and then ramps up slowly up to full load, according to documentation. Those who, for some reason, want the fan to spin at all times can override the ECO mode by flicking the switch on the front. Labelling is pretty obvious for the various cables, with four receptors for graphics and a matching four for SATA and peripherals, though it doesn't matter if you mix up SATA and Molex because the cables connect the same way. Said cables match the black aesthetic of the unit nicely but aren't flat and take a bit of force to turn and twist through a chassis' cutout routing holes. We'd encourage EVGA to invest in flat cabling that not only makes the build look cleaner, but is easier from an installation point of view. Lengths are standard, too, with the ATX measuring 600mm, 8-pin ATX 700mm, 10x SATA between 550mm and 850mm, 6x PCIe (4x 8-pin, 2x 6-pin) from 700mm to 850mm and 4x Molex from 550mm and 850mm. Finally, a Floppy extender rounds off the 16 connectors. The beauty of a fully-modular supply is that you connect only what you wish to use, obviously, enabling tidier builds. A minor criticism rests with the way the PCIe graphics cables are organised. Though the supply and cabling supports a quartet of 8-pin connectors suitable for powering two very high-end cards, the cabling arrangement is such that, if implemented in that fashion, all four PCIe cables need to be used. The downside is that the 6-pin connectors, which run off the same cables and are therefore attached, become redundant yet visible. Perhaps two cables with a couple of 8-pin connectors would be better? Congratulations to the PSU geeks out there if you managed to identify Superflower Leadex as the PSU platform provider. There's no skimping going on here because all of the capacitors - primary and secondary - are sourced from Nippon Chemi-con. Line filtering is very good, while soldering is excellent. 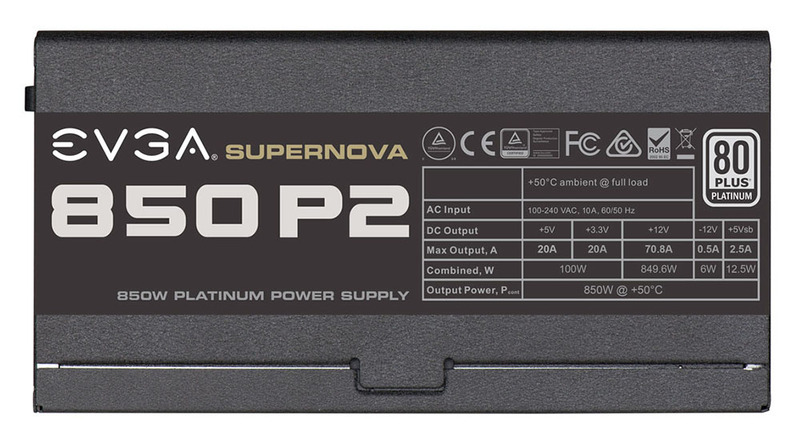 A single 12V rail provides all the available capacity, as usual, and understanding that this 850W is primed for top-tier performance, the full capacity is guaranteed at 50°C load - you simply won't see better on a consumer supply. 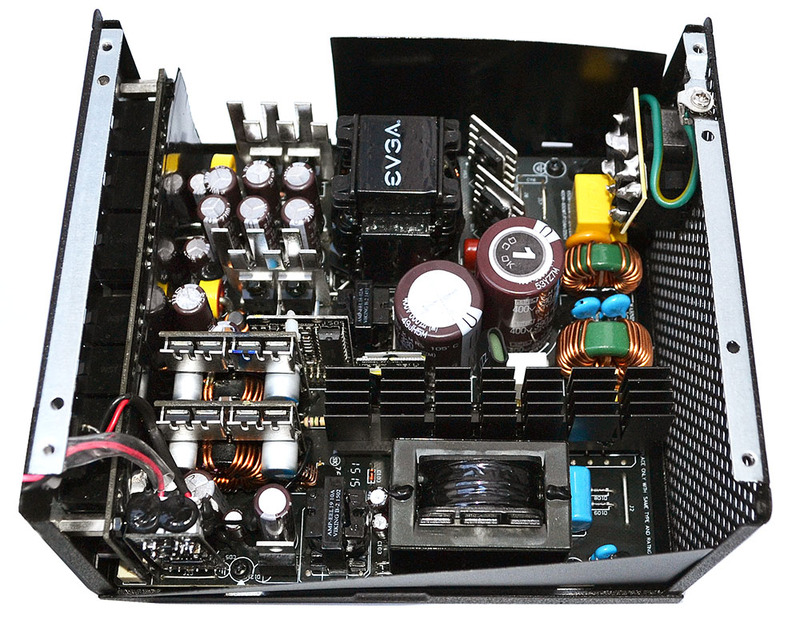 A PSU package is more than the quality of the components used. 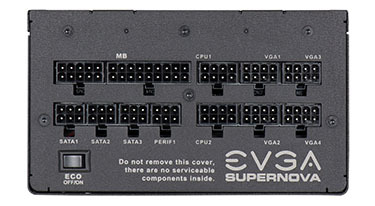 EVGA offers a 10-year warranty upon registration that we believe to be the longest in the industry. 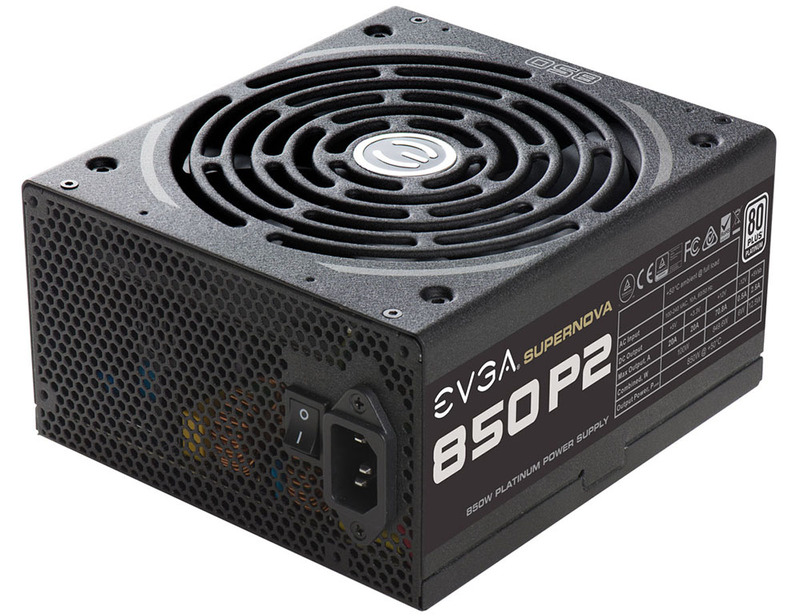 80 PLUS Platinum efficiency rarely comes cheap though the EVGA SuperNOVA 850 P2 is priced at a competitive £120, or £20 above the best Gold-certified models.